The 2016 NRADC Team was a product of creative thinking for both the CT Dressage Association and the CT Dressage and Combined Training Association. Each Association had two members that wanted to ride on the team, so it was decided to have a combined team called the CDA/CDCTA Team. The team members were laughing that we should have been called the “Come-Back Kids” because each and every one of us had dealt with human and/or horse related issues during the past year! Members from the CDA Association included Sherri Pasquale riding Zalani and Nicole Boutot riding Linus. Members of the CDCTA were Emily Wilson Garbo riding Moose on the Loose and Karen Norton riding Mystique! 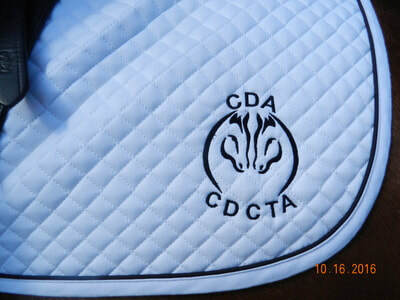 A special thank you to Linda Roche, who organized the team this year, for providing all the team members with a beautiful embroidered pad sporting the CDA/CDCTA Team logo! The team finished in a closely contested 3rd place. 2nd and 3rd place teams were very close and separated by a mere .05. The 1st place team was ahead by about 1 point! All Teams were awarded two beautiful ribbons corresponding with the finish, one ribbon for the brow band and one ribbon to go around the horse's neck. Of course our ribbons were glorious yellow! In addition, we were awarded a beautiful embroidered wool quarter sheet for placing third. All CDA/CDCTA Team members chose to do a Musical Freestyle, and all team members pinned individually. Additionally, Emily Wilson Garbo and Moose on the Loose finished in first place in the First Level Musical Freestyle on Sunday. Individually in the NRADC competition, Sherri finished in 3rd place, Emily finished in 4th place, Nicole finished in 9th place, and Karen finished in 10th place. Each individual was awarded an embroidered saddle pad, along with another set of two beautiful ribbons in the color appropriate to the finish. For the victory trot the CDA/CDCTA team each sported a 3rd place ribbon and individual placing ribbon on the brow band and matching ribbons around the horse's neck. We were a very festive and happy team. I highly recommend if you are an Adult Amateur that you consider riding on next year's team! Despite a stormy beginning to the weekend the weather cleared and it was one of those perfect Connecticut fall weekends! 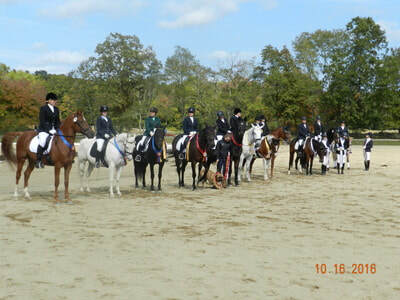 Many riders and horses arrived at the Mystic Valley Hunt Club to show off their Dressage skills. This Fall Finale show offers something for every dressage enthusiast. Part of the competition is an Adult Amateur Championship and an Individual Championship. There were 10 teams in all and 25 riders. 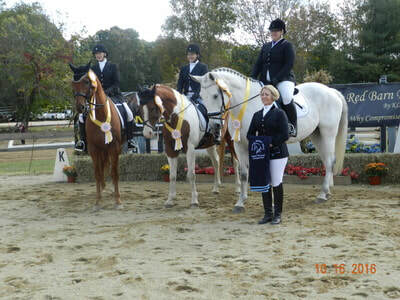 CDCTA fielded a team of four riders for the team championships and three of those riders also competed for an individual championship. Joelle Conover riding Tribute to Securitee, Trish Panico riding Hampton, Jane Wasyl riding Bay Breeze, and Tracey Woods riding Dynamic Lisa. For the team championships the riders had to compete at the highest test of the level they had been showing this year. For the individual championships the riders had to compete in a musical freestyle in addition to the highest test of their level to receive a combined score. The CDCTA team came in 5th place out of 7 teams. And Joelle Conover was the 5th place Individual Champion and Trish Panico was the 10th place Individual Champion. Nearing the end of the show season horses and riders came ready to ride and put their recently honed skills to the test. Several of the riders commented that the best part of this show was meeting and getting to know other club members. Making new friends and catching up with old friends. Watching our teammates ride to music and compete for the CDCTA team created new bonds and an added appreciation for the hard work we have all been putting in this year. Ribbons aside, being part of the team and having club members come to watch and cheer us on was by far the best part!